American football linebacker for the Atlanta Falcons Stansly Maponga had a big adjustment to make. "Just…shoes, I'd say that," said Maponga. "I didn't have shoes growing up." The third-year Falcons linebacker has a hazardous occupation, taking on 300-plus pound offensive linemen who will do anything in their power to keep him off their quarterback. Maponga, however, has some perspective: he grew up in Zimbabwe, a country in southern Africa, living there until he was 9 years old. "I grew up in it," said Maponga. "Knowing what I know now, it wasn't safe." Maponga is the first ever NFL player from Zimbabwe - a point of pride. He has many positive memories of growing up in Africa, but many were challenging. "Back home, kids grow up a lot quicker because you have to go look for food and stuff like that," said Maponga. "[I hunted for] mostly deer, squirrel. Also rabbits, too." In his third season out of Texas Christian University, Maponga is looking to expand his role in Atlanta and solidify his spot on the team; for himself and his career, yes, but also to put himself in a better position to be able to give back to kids in Zimbabwe. "Donate shoes, clothes, food all that type of stuff," said Maponga. "It didn't really sink in until my mom really let me know what was going on [in Zimbabwe]. I can really change lives back home." The former fifth round pick has appeared in 24 games during his first two seasons, registering eight total tackles. Listed as 6'2, 265 pounds, Maponga is listed as a linebacker on the roster, but played mostly defensive line during Wednesday's 11-on-11 drills at training camp. "The initial thing that jumps off with Stansly is when we put him outside at defensive end, he has real quickness to go," said Falcons head coach Dan Quinn. "He's really improving. He's a guy who works extremely hard. as we feature him, we're trying to find the best pass rush spot for him. That's what we're featuring with him during camp." From Zimbabwe to the NFL, Maponga is proud of his journey so far and is excited about what's to come: on the field and how he can help off of it. 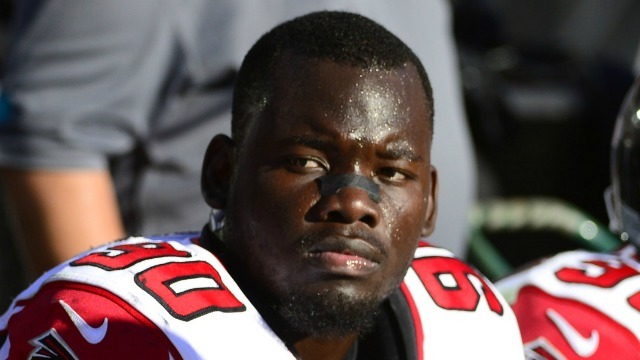 "I think about it, man," said Maponga, "I came a long way."